Riverhead Sewer District Superintendent Michael Reichel and U.S. EPA Regional Administrator Judith Enck at the Riverhead Sewage Treatment Plant Friday. From Riverhead to Shelter Island, environmentalists were celebrating all across the East End Friday with the launch of two innovative new projects to help improve water quality here. 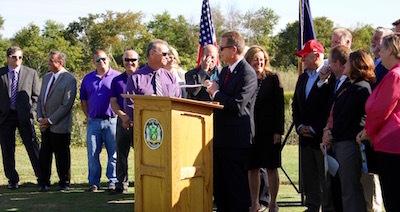 In the early morning sunshine, they first met on the Indian Island Golf Course in Riverhead to celebrate the completion of a $23.5 million upgrade to the Riverhead Sewage Treatment Plant — one that environmentalists say will dramatically reduce the nitrogen entering into the Peconic Estuary, while at the same time providing irrigation to the golf course, which is next door to the sewage treatment plant. They then traveled out east, hopping on board ferries to Shelter Island to celebrate the groundbreaking for Suffolk County’s first non-proprietary constructed wetlands project. It was a fitting end to both National Estuaries Week and Smart Septic Week. Indian Island Golf Course, on the edge of the Peconic Estuary, will soon be irrigating using reclaimed water from the Riverhead Sewage Treatment Plant. Riverhead’s sewage treatment plant has long gotten a black eye from the public. Built as a WPA project in 1936, sewer district attorney Richard Ehlers said on a tour of the facility Friday that the project had been so controversial at the time that all the members of the town board were voted out of office. The plant has since come under intense public scrutiny for exceeding discharge standards on many occasions. But that process took time. Mr. Reichel first envisioned the project about 15 years ago. Monday evening, Sept. 26 at 9 p.m., when the reclaimed water sprinklers first turn on at Indian Island Golf Course, they will be using reclaimed water that is treated to a standard of 3 mg/L of nitrogen — far lower than the drinking water standard of 10 mg/L. And because the water will go through the sprinkler system and then filter through the sand below the golf course, instead of being directly discharged to the Peconic River as is done now, it will be further filtered by natural processes before reaching the bay. 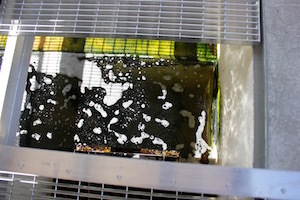 Treated wastewater undergoing UV filtration at the Riverhead Sewage Treatment Plant. Kevin McAllister of DefendH20, long a critic of the Riverhead Sewer District, who has patrolled the Peconic River looking for excessive discharge and filed Freedom of Information requests that revealed violations at the sewage treatment plant, had nothing but nice things to say about the plant on Friday. Kevin McDonald, of The Nature Conservancy, who serves as the chairman of the Peconic Estuary Program’s Citizens Advisory Committee, said the Environmental Protection Agency’s Total Maximum Daily Load figures for nitrogen for the Peconic Estuary place the Riverhead Sewage Treatment Plant’s contribution to the nitrogen load at 25 percent. Mr. McDonald added that the plant is also in a critical area within the estuary, at the far inland edge of the bay, where the cleaning influence of tidal flushing into the ocean isn’t as strong as farther east. “Now we have to do this elsewhere,” he said. The sprinklers at the golf course will operate between April and Thanksgiving, diverting about half of the liquid effluent from the sewage treatment plant’s annual discharge of just over a million gallons of wastewater per day. The plant has the capability of treating up to 1.5 million gallons per day. Mr. McAllister said those months of the year, when the weather is warmer and excess nitrogen is far more likely to feed dangerous algae blooms, are the most crucial ones for reducing the nitrogen load. Financing the plant has proved a long-term project. The sewer district received a $2 million grant from the DEC for the project in 2006, followed by an $8.1 million Suffolk County Sewer Infrastructure Grant in 2013. The remainder of the project is being paid for by a 20-year loan from the New York State Environmental Facilities Corporation. Even the EPA was so impressed that they gave Mr. Reichel their Environmental Champion Award in April of 2015, even before the project was finished. “It may have been premature, but we’re thankful he didn’t make us look foolish for selecting him,” said EPA Regional Administrator Judith Enck, who stayed after the press conference for a detailed tour of the work at the sewage treatment plant. At Sylvester Manor’s press conference on Shelter Island. 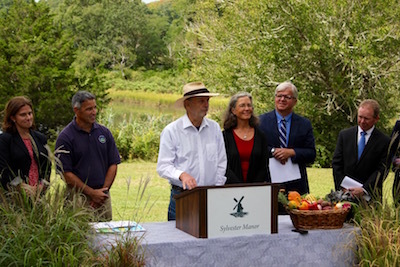 Over on Shelter Island on Friday afternoon, environmentalists, elected officials and employees at the Sylvester Manor Educational Farm were also celebrating another innovative septic project Friday afternoon. 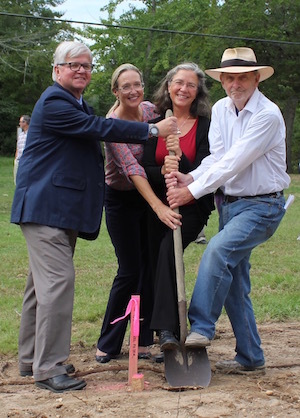 State Assemblyman Fred Thiele, County Legislator Bridget Fleming, Sylvester Manor Planning and Conservation Director Sara Gordon and Shelter Island Town Supervisor Jim Dougherty breaking ground for the Sylvester Manor project. The farm is just breaking ground on Suffolk County’s first non-proprietary constructed wetlands, funded in part by the Suffolk County Drinking Water Protection Program, by an education grant from the Long Island Community Foundation, and by donations from community members and board members, farmers and staff at Sylvester Manor. The wetlands, constructed by New Jersey firm Natural Systems Utilities, will filter effluent from new restrooms for visitors and staff at the farm’s 1737 Manor House, with the hope that it will reduce nitrogen levels by 90 percent. Shelter Island Town Supervisor Jim Dougherty said that he’s long heard that there are just three important issues on the island: ticks, taxes and the aquifer. “We have a major challenge, and it’s here and now,” he said. Sylvester Manor Planning and Conservation Director Sara Gordon said the grant from the Long Island Community Foundation will enable the non-profit to develop educational programs surrounding the wetlands project, helping children to learn the importance of being good stewards of the land and water. She said the county grant will also enable local contractors, like Shelter Island Sand & Gravel, to learn how to build and maintain alternative septic systems. Peconic Estuary Program Director Alison Branco said she was happy to cap off both Smart Septic Week and National Estuaries Week on Shelter Island. State Assemblyman Fred Thiele, one of many environmentalists and elected officials who attended both press conferences Friday, said at both events that these projects are great examples of the type of work that could continue if voters approve the extension of the Community Preservation Fund real estate transfer tax this November. The extension, to 2050, would allow towns to use up to 20 percent of the money for water protection, in addition to preserving land.